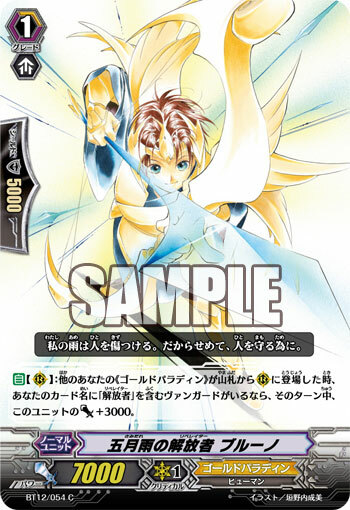 [AUTO](RC): When a « Gold Paladin » is placed on (RC) from your deck, if you have a vanguard with ‘Liberator’ in its card name, this unit gets [Power]+3000 until end of turn. One of the Liberators of the United Sanctuary’s second standing national army, « The Gold Paladins ». He is a master of the bow « Early Rain », which uses huge bladed bolts as projectiles. These bolts can be used like swords. He was born into a family of knights, and was forced to learn the ways of swordsmanship and chivalry from his father, but deep down, he hated hurting others more than anything, and longed for a peaceful life and get married, and had little interest in the battles most of the knights found themselves drawn into. But a few years ago, an ambushed occurred, resulting in his father being taken away by a mysterious group cloaked in black light and most of his family injured. Regretting he had been unable to do anything, he finally joined the Paladins. He joined them in order to find something, someone, to protect, and to never see the ones he loved ever get hurt again. He became a knight carrying such feelings inside his heart. One might dare say his enemy is the notion of war and fighting itself. The Knight of the early summer rain responds to the King of Knights’ ideal of a peaceful world without war of conflict with his bow of light.